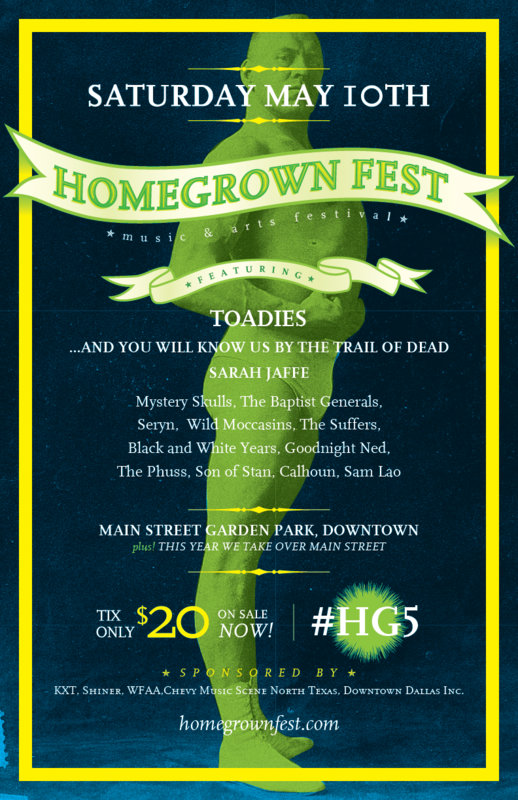 The 5th Annual Homegrown Festival will once again fill vibrant Downtown Dallas with music and art at Main Street Garden Park on Saturday May 10th. We’re excited to announce indie powerhouse …And You Will Know Us by the Trail of Dead, local heavyweight Seryn, Houston’s Wild Moccasins and The Suffers, Austin’s The Black & White Years and DFW’s own Goodnight Ned & The Phuss. Festival headliner The Toadies was already announced earlier this month. The rest of the line up will be announced 3/4. The bands, all with ties to the state of Texas, will be performing many genres and styles of music on the Shiner Beer stage and the Chevy Music Showcase stage. Also back is our partner KXT 91.7. They will have the KXT artist lounge on premise again. Tickets are $20 online and $25 at the gate the day of event. As a family friendly bonus, kids under the age of 10 are absolutely FREE! This one-day event takes place at Main Street Garden Park, at 1900 Main St. (between Harwood and St. Paul). Gates open at 11am. Tickets, including VIP and bundles including a custom limited edition T-shirt, are now available via local, online ticket outlet Prekindle.